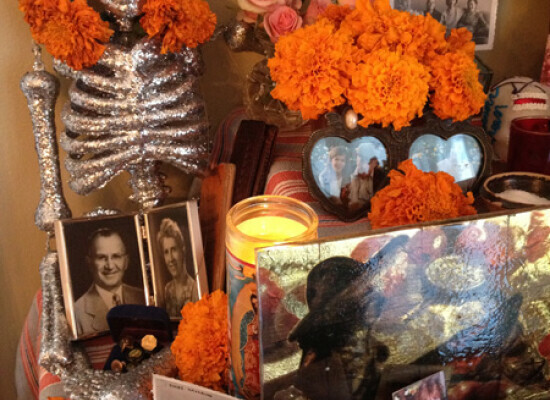 Whether it’s a colorful silk banner, painted in memory of a loved one, or a marigold-filled altar, replete with sugar skulls and photographs of family members who have died, All Saints and All Souls Day brings an opportunity to remember that in the Christian faith, death is a transition, not an end to life. It’s a colorful and artistic celebration at St. George’s, Texas City to commemorate the lives of loved ones who have died. 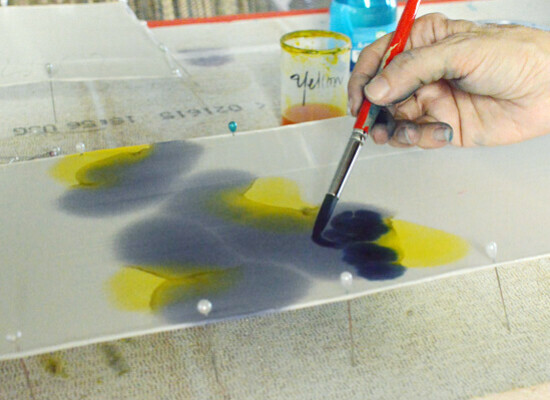 With only a silk scarf and dye, parishioners are able to paint the lives of those who are no longer with them. The idea for “A Beautiful Grief Project” emerged soon after artist Lisa Tenney experienced the sudden loss of her brother-in-law. She wanted to express her memories of him in color. “I was just thinking of the colors of his life and thinking I would like to portray that on silk,” Tenney said. 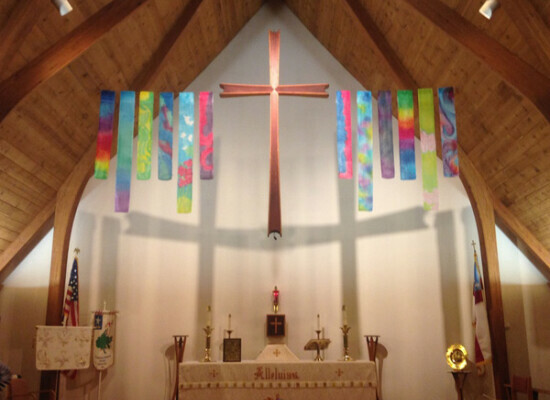 “I really feel like God put the idea in my head,” she said, explaining that the silk paintings will be hung together in the church’s nave and “unveiled” on All Saints Day’s during a community-wide service, November 1 at 2:00 p.m.
From a theological perspective, the Rev. Robin Reeves, rector at St. George’s, explains that the silk paintings are a representation and prayerful offerings for loved ones, each done by a friend or family member for the celebration of All Saint’s Day. Many parishioners have participated in A Beautiful Grief Project. 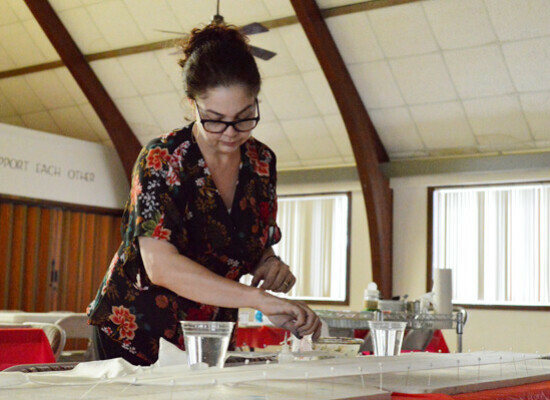 The quiet and peaceful parish hall at St. George’s was fully equipped with all colors of dye and a strip of silk pinned to a sturdy repurposed ceiling tile on a table. Each participant selected the colors that reminds them of their loved one. With each stroke of the paint brush, the thin white silk easily absorbed the dye as their designs spread across the clothes, ultimately creating a unique piece of art. Once dry, the pieces were hung in the church. McKnight used purples for her husband and blues for her niece. “When I met my husband, he had a purple shirt on. Blue just seemed like a good color for her,” said McKnight as she remembered her loved ones. “With all the other silks that will be hanging, I just felt that it was a larger symbol to me showing my love for them,” she said as she marked her last stroke of dye on the silk scarf. Reeves explained that “grief unites us as we’re united through the body and blood of Christ.” And it’s also our coming together that is transforming, she added. She also shared a unique story in which silk art had impacted her life in a very personal way. “I learned I had a sister I didn’t know this summer. She had never met my father and so I painted her a silk in honor of my father with the saying he considered important: ‘Dare to Dream’, and I will give it to her once we are done. So it’s a beautiful way for people to pass on the memories of our loved ones as well,” Reeves said. 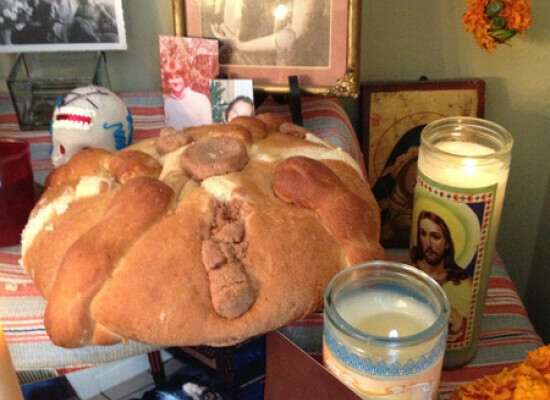 Meanwhile, at the Hispanic congregation San Francisco de Asis in Austin, the Rev. Bertie Pearson takes a slightly different, but traditional approach when celebrating All Saints Day with his congregation. 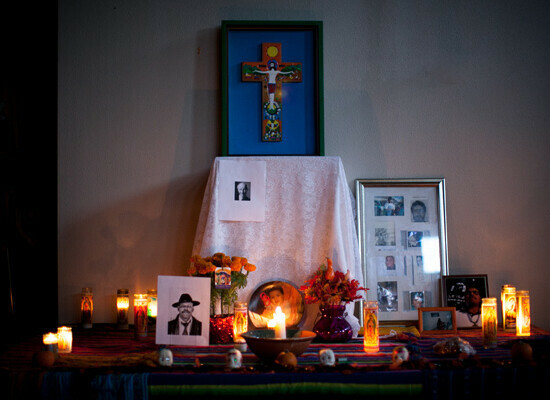 Instead of painting and hanging silks, members build a traditional altar to honor the dead. 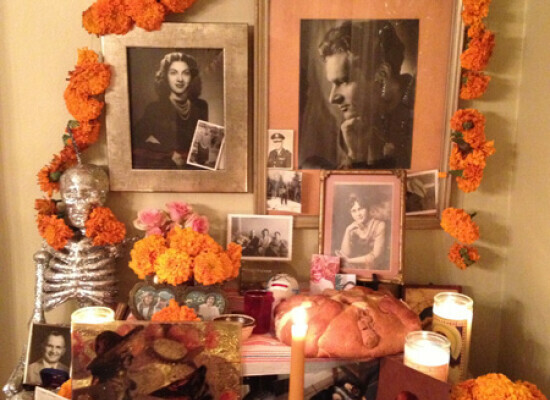 The white altar contains photographs and memorabilia of those who have passed away, sugar skulls, marigolds and other flowers and special pan de muerto (bread of the dead). 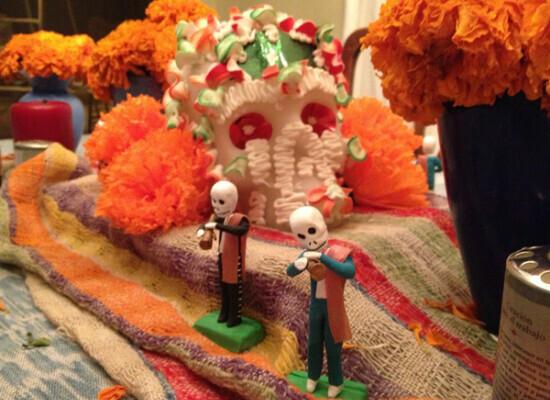 According to the National Geographic, Dia de los Muertos celebrates the lives of the deceased with food, drink, parties and activities that the dead enjoyed in life. One of the most familiar symbols of this celebration may be the calacas and calaveras (skeletons and skulls), which appear everywhere in Latin America and increasingly in the United States during the holiday: in candies sweets, as parade masks and dolls. Both calacas and calaveras are almost always portrayed as enjoying life, often in fancy clothes and entertaining situations. Since medieval period, a three-day celebration took place to pay tribute to the dead and to saints. It begins on “All Hollows,” a celebration of the vigil of All Saints on October 31. On November 1, “All Saints Day” is a very special feast of the church and is one day when baptisms traditionally take place. Martyrs and saints of the church are also paid tribute. 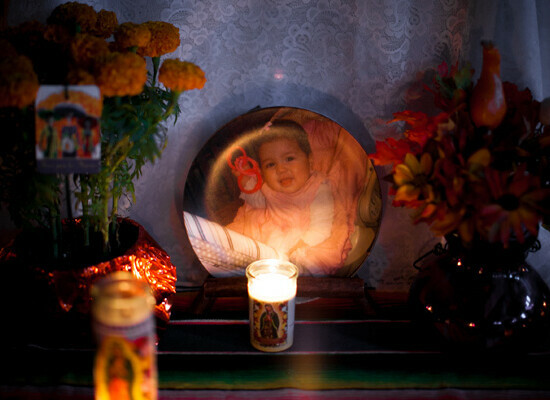 The third and final day of festivities is November 2, “All Souls Day,” when loved ones who have died are remembered. The message that resonates with “A Beautiful Grief Project” and an altar for the dead at San Francisco de Asis is that death is not final. “Christians are immortal. There is no death. Christ has destroyed death once and for all in resurrection,” Pearson explained. 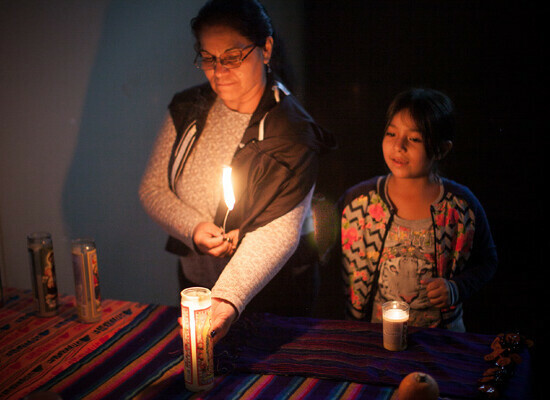 At San Francisco de Asis, a traditional Eucharist service will be held on November 2, “All Souls Day” at 7:00 p.m. where parishioners will add names of those who have died to be remembered. - (C. S. Lewis in Letters to Malcolm, pp. 107-109 ).